an open fitted kitchen of 20m², open to a terrace of 50m², a dining room of 30m² with a fire place, a lounge of 18m², a living room of 25m² with a woodburning stove. a bedroom of 20m², a bathroom and wc, a utility room of 13m², landing of 10m², a larder of 12m². First Floor: A large mezzanine of 36m² used as a study or lounge, a shower room of 5m², a wc. There are 3 double bedrooms, 17m², 13m², 12m².An attic of 31m² which can be converted into a bedroom. Basement includes a a room of 47m², wine cellar of 7m², a boiler room of 6m², a wc, a boiler room of 6m², a vaulted cellar of 30m² and another one used as a larder. Including Agency fees of 6% to be paid by the Buyer. A spacious stone property of approx 395m² with a very high quality of restoration (4 bedrooms), in excellent condition with a patio and car port, a swimming pool and a guesthouse. A large garden of approx 8.75 hectares, a well. Wonderful view. The property is perfectly situated, taking full advantage of the south aspect and beautifull view of the valley beyond. 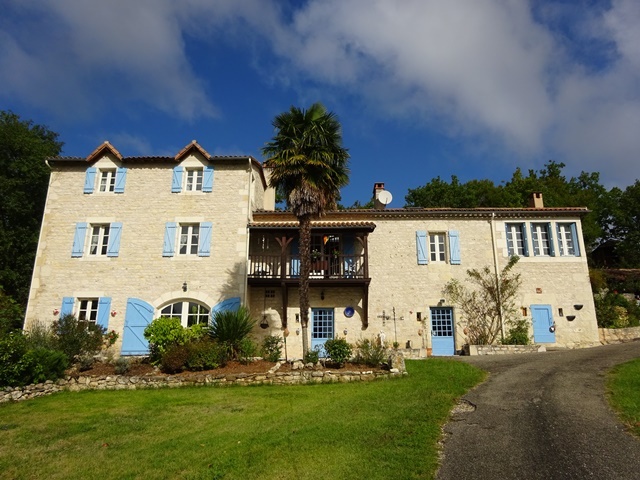 10 km from a village with all the amenities and 20 km from Cahors. Water, electricity, double glazing, gas central heating, septic tank.